At ProRoofing, rather than using scaffolding subcontractors, we have an in-house scaffolding division for all roofing projects. Using our own scaffolding enables us to maintain direct control over each element of your project and ensure that the highest standards of safety are achieved at all times. It also means that we don’t have to wait around for scaffolding to be erected. 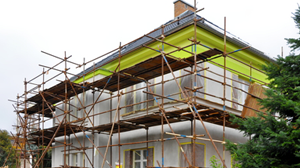 We can easily install all the necessary scaffolding and get to work immediately after it is installed. Site scaffolding is incredibly important as it protects the health, safety and welfare of both the tradesmen on site and the customer or anyone else who may have temporary interaction with the site. In addition to using our own scaffolding for are own projects, we also provide scaffolding services to other businesses. Our expert scaffolding team can provide uniquely designed scaffolding to fit buildings of any size of shape. This scaffolding can be of use during extensions projects, redecorating projects, new builds and general maintenance work.